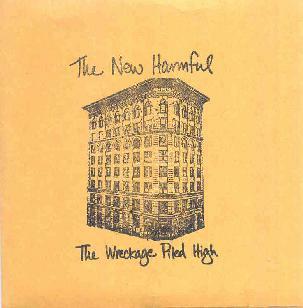 The New Harmful - "The Wreckage Piled High"
Western Massachussettes doesn't immediately come to mind as a hotbed of musical inspiration, but it doesn't take long to figure that's an incorrect assumption. Things have been happening since Dinosaur jr. broke out of the underground scene into MTV-proportioned "alternative" music stars. Grassroots venues such as the Flywheel Collective in Easthampton (and occasional "events" at diety-of-rockcriticism Byron Coley's Glasseye books) have given local experimentalists a local outlet (see the Joshua Burkett review in the previous issue of AI). And most Aural Innovations readers are probably familiar with Architectural Metaphor as long-established spacerockers in that region. Actually, the Dinosaur jr. reference makes a fitting introduction to this review, as the New Harmful definitely fit the "indierockers with loud guitars" genre that they and other mid/late-80's bands (Sonic youth, Yo La Tengo, et. al.) pioneered. The kinetic rhythms and driving guitars here are compelling throughout, while the additional textures of male/female vocals, Farfisa organs & other keyboards, and various percussives are intelligently arranged, giving the album more character overall than one might expect from either an indierock or spacerock effort. Highlights include "Orbit Ship", with some great extended guitar-freakout/destruction, and the dense, soaring guitars on "Off Your Hill". The real treasure here, especially for AI readers, would be the penultimate track, "Your Light It Scares Me, Dear" (an extended reprise of its' shorter, jerking and pouding, yet understated, precursor, "Your Light"), which both start with a sparse shaker-percussion introduction and what sounds like the band tuning/warming up. The song portion's subdued, morose vocals aren't too remarkable, but the subsequent pounding guitar and droning, melodic denoument are. Still, even on that track, the production and overall sonics are a bit too clean for it to be the blanga-ridden masterpiece one might hope for. But that doesn't prevent it from being fine example of end-of-the-90s cross-fertilization. For more information you can visit The New Harmful web site. Contact via snail mail c/o Youth Electronix Records; 720 Hampden St #1-L; Holyoke, MA 01040.